Is a ‘Lost Decade’ Possible for South Korea? The government acknowledges that difficult reforms are necessary to avoid a Japan-sized economic slump. There are growing reports that the South Korean government and central bank are becoming increasingly concerned about the country’s slowing economic growth and negative demographic trends. The government’s recently announced stimulus package is an attempt to address the first part of its problem by halting the recent slide in economic growth. 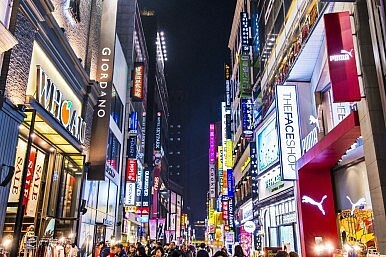 It appears that South Korea is aware of its potential to experience the same kind of long-term economic stagnation that Japan experienced during its two “lost decades.” While it may not have an answer for the more problematic and long-term problem of population decline at this time, there are signs that the government understands it will have to think beyond the realm of periodic, short-term stimulus packages. South Korea is experiencing two short-term economic problems that are highlighting what could easily become a long-term trend. Consumer spending took a heavy hit in the months after the Sewol ferry sinking, with GDP increasing just 0.6 percent in the second quarter of 2014 over the previous quarter, making it the slowest quarter of growth since the third quarter of 2012, or a seven quarter low. The director-general of the central bank’s economic statistics department, Jung Yung-taek, said that consumer spending was also affected by large layoffs by securities and insurance companies, and that it was unclear if this dip could be fixed in the short-term, according to the Nikkei Asian Review. Exports were credited for the modest economic growth that South Korea experienced, but even that part of the economy is starting to experience headwinds.The South Korean won has strengthened significantly over the last six years, reaching almost 1,000 won to the dollar recently after lows of nearly 1,500 in 2009. This appreciation has seen South Korean corporate heavyweights like Samsung Electronics and Hyundai Motor register falling year-on-year profits for the second quarter of 2014. At the same time the government announced its slowing economic figures, it also announced its 41 trillion won ($40.5 billion) stimulus package on July 24. The government’s plan is part of a macroeconomic policy consisting of fiscal, financial, tax and regulatory reforms. The Finance Ministry said it will run its “fiscal stance in an expansionary manner during the second half and in 2015 so as to consolidate the base for the economic recovery. The expansionary stance will be in place until its impact materializes,” according to the Korean Herald. This type of comprehensive stimulus package is exactly what Japan has done in the past and is currently undertaking, and with limited lasting positive effects. In another correlation with Japan, the Bank of Korea released a working paper on Monday that showed the significant financial burden the country’s aging population will impose on the generation currently in their 20s and 30s. The report showed that this younger generation will pay 100 million won more into public social benefits than they will actually receive. In contrast, in 2011 those in their 60s on average received 40 million won more than they paid into public benefits. Even with such a large discrepancy in the payment versus benefits for younger generations, the government is still lagging behind in tax revenue. The Finance Ministry said it will miss its tax target of 216.5 trillion won for this year by 8.5 trillion won. Despite several short and long-term challenges to South Korean economic growth, it has two distinct advantages to help prevent it from repeating Japan’s mistakes: time and foresight. South Korea has a track record of identifying markets where it can exploit its comparative advantages and innovation (like shipbuilding, automobiles and electronics) by directing government and major company resources toward them, which drove its last decade of economic success. This single-mindedness can be useful in both identifying new areas for growth, but also for pursuing policies that may be unpopular and economically painful. The government appears to have identified two areas that need be addressed for long-term economic reform: the appreciation of the won and a lack of tax revenue. However, while several government agencies have acknowledged these problems need to be taken up, there have been no policy recommendations to fix them, only a commitment towork concertedly toward their solution. This is where time will play a crucial factor, as South Korea will not want to wait as Japan did to address the fundamental nature of its economic problems.